DC’s The Batman Who Laughs, a one-shot tie-in to the publisher’s ongoing Metal event, doesn’t drop until November, but during a panel at this year’s New York Comic Con writer James T. Tynion IV revealed the twisted Joker/Batman hybrid’s origin story, and it’s as cool as it is horrifying. Writer Scott Snyder opened the panel by explaining that while the squad of evil, alternate-reality Batmen are something like the Justice League’s ultimate foes, they’re also manifestations of Batman’s greatest fears about himself. Unlike the other dark Batmen, who all come into being as a result of Batmen turning on his allies before taking on elements of their identities and powers, The Batman Who Laughs origin story is actually an answer to a question: What if Batman finally killed the Joker once and for all? While Tynion didn’t say exactly how this Batman killed his Joker, he explained that the death involves Batman being exposed to a potent form of the Joker Toxin that exists within the villain’s heart. Fear of that exposure, Tynion said, was one of the things that held Batman back from striking a fatal blow. But once he made the decision to settle things, he’s forced to deal with the consequences. After being exposed, Batman quickly realizes the toxin doesn’t drive him insane as it usually does with others, but instead begins to shut down the centers of his brain that govern inhibition. What begins as random laughter at inappropriate times eventually becomes something darker. Anticipating that other members of his alt-reality Bat family will realize what’s happening, Bruce gathers them all to tell them about the strange changes he’s going through. Nightwing, Batgirl, and the others are immediately understanding and tell Batman that they won’t rest until they find a way to stop the Joker toxin, but Bruce informs them that he doesn’t want to stop it. And then he murders every single one of them—the people who have spent their lives fighting to make his vision of a world without evil a reality. 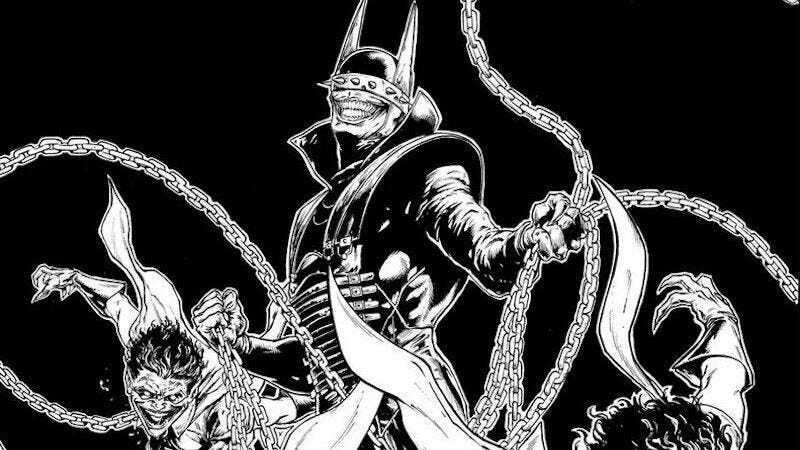 We’ll have to wait until November 16 to learn just how the Batman Who Laughs comes to lead the other Darker Knights when his self-titled one-shot hits stores on November 16.